In addition to corporate donations there have been many individual donations, both spontaneous and in response to fundraising initiatives. If you would like to help, please see our “Contacts” page for details. Our work depends entirely on charitable donations. Last Year, the Pfeiffer MHA Programme 2018 …Raised £263.00 for BRINOS. Many Thanks to Debbie Clench, who ran the Bournemouth half marathon and raised nearly £1000. Septodont UK Ltd ( http://www.Septodont.co.uk/)for Lignospan. Thanks to the British Medical Association (BMA) Charitable Donations Committee for their generous award towards the completion of the operating theatre. This £8,000 has has covered the terrazzo floor and marble work surfaces, the carpentry work to create all the cupboards, the stainless steel scrub-up sink and 3 Air Conditioning units. Thanks St Marks Overseas Aid Trust (SMOAT) for £1,000, which funded a specialised mechanical multi-position operating table. PF Charitable Trust for a very generous donation towards the building of the BRINOS Ear Care Centre (BECC). THE ANTHONY & PAT CHARITABLE FOUNDATION for their very generous donation towards building the BECC. David Cottam who ran the 2013 London marathon for BRINOS raising £2500. Reading Road Runners who raised a very impressive £22,227 in a year-long charity drive for us. Marc Ratray who through his Speakers event in 2013, raised over £400. The MHA students of Pfeiffer University, USA for their generous gift of $325 following a recent Comparative International Health trip to London. Yvette Youngs who raised funds with a sponsored cycle ride, and again in the 2014 London Marathon. Amdipharm PLC ( http://www.Amdipharm.com/ ) , for Gentisone HC ear drops. Higgs Group Printers (www.higgsgroup.co.uk/printers) for printing the new BRINOS leaflets. Aman Kapila Memorial Fund (http://www.amankapila.com/ for the donation of an oxygen concentrator. Oxford/Bucks BAHA Users Group for an uninterruptable power supply unit. In 2008 BRINOS received a second substantial donation from The Prince's Trust. We wish to thank The Prince's Trust for this donation which follows a generous donation, some years ago. …or you could use our page on the Virgin-Money-Giving page. Just click the logo to donate (safely!) They will also handle HMRC Gift Aid. 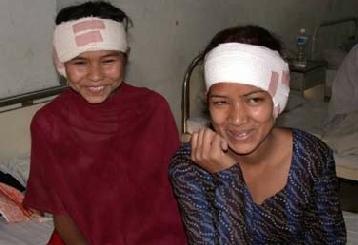 Charitable donations fund the vital manpower and equipment needed to sustain the Primary Ear Care and Hearing Aid Programme. 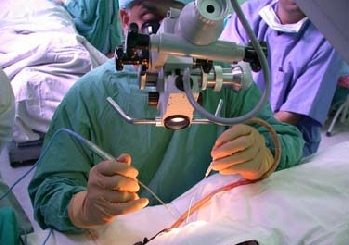 In addition funding is required in order to purchase and maintain the specialised equipment needed to undertake middle ear microsurgery. (The team provide for their own travel etc. for the bi-annual Ear Camps to Nepal) The recent main BRINOS funding drive has been to build the new Ear Care Centre at Nepalgunj. See those pages here. The BRINOS XMAS GIVE in 2006 raised GBP 6,880 of which GBP 6,000 was matched by our very kind sponsors. Thus the total was £12,880. Well done and thank you to everyone. 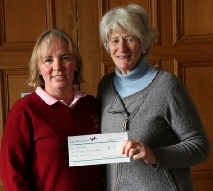 Alison Talbert, Lady Captain of the Wraggs Barn Lady Golfers, presenting a cheque to Sue Weir (right), for the £2,500.00 which she raised during her year as Lady Captain. Thank you to all those ladies.